Basques live for cooking and eating. I haven't found a similar level of passion anywhere I have traveled. If we try to describe Basque cuisine, a fair answer might be that it is deeply felt, honors tradition, and respects the natural flavors of the ingredients. These qualities are on display in the significant number of dishes that are distinctively Basque. The international acclaim achieved by the new Basque cuisine movement led by Juan Mari Arzak is only the most recent example of how Basque cookery has influenced the tables of the rest of Spain and beyond. Basque fishermen have been sailing the northern Atlantic since the eleventh century. While following the whale, which at the time was the most treasured catch, they encountered banks of cod off the coasts of Terranova (Newfoundland) in the Gulf of Saint Lawrence. On nearby islands, some settlements still carry Basque names, and salt cod, or bacalao, is a hallmark of Basque cuisine. Some historians believe that Basques landed in America before the arrival of Columbus, but while explorers and discoverers proudly proclaim their findings, fishermen never disclose the source of their catch. The sea has always provided nourishment for the Basques. Squid, preferably the small ones called txipirones, are cooked in an onion sauce with their ink, to produce txipirones en su tinta. The deep black of the sauce initially evokes curiosity and sometimes aversion in the uninitiated, but after the first bite, reservations dissolve in the velvety texture of the squid and sublime taste of the sauce. Though more and more scarce, merluza (hake), or lebatza in Basque, from the Bay of Biscay knows no paragon (with all due respect to its austral relative from the southern seas). The darker-skinned Basque hake has firm, delicious flesh. Cooks typically panfry the medallions from the upper body and either roast the tail in one piece or cut it crosswise into "steaks" for merluza en salsa verde, the classical green sauce preparation. Merluza en Salsa Verde: This recipe is one of the front-runners of traditional Basque cooking. Salsa verde appears in many dishes: with clams alone, with monkfish or fresh cod, or with a combination of clams and hake, as in this recipe. 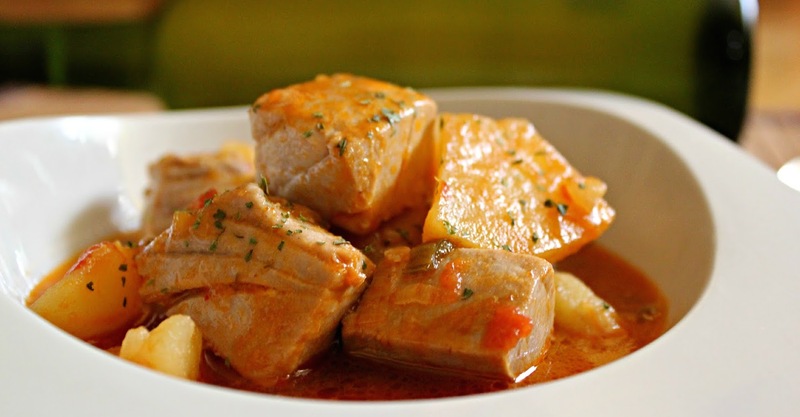 Marmitako, the potato and tuna stew originally prepared by fishermen on their boats, has become a standard offering in many restaurants. The tuna belly, called ventresca (or ijada in Basque), is extremely juicy, flakes beautifully, and is the best tuna for salads. It is usually roasted in the oven with just a little garlic and a splash of olive oil. Bacalao, or salt cod, is a staple of the Basque kitchen. Basques are masters of the art of turning a stale and salty fish into something sumptuous, specially when prepared pil-pil style, in an emulsion of the cod's gelatin and olive oil. Other cod preparations, such as a la vizcaína, Club Ranero, and ajoarriero, the latter a loan from neighboring Navarra, are also popular. A la vizcaína, or Biscayne style, describes a dish cooked in salsa vizcaína, a dried-pepper sauce. The dried peppers, called choriceros because of their importance in the production of chorizo sausages, are harvested at the end of the summer when ripe and hung from the facades of farmhouses to dry. The area surrounding Gernika is famous for these sweet and delicate peppers. Those not destined for drying are harvested while still green, fried with olive oil, and served as accompaniment to meats and fish, and sometimes alone as a first course. Delicious red beans also come from Gernika, although Alubias Rojas de Tolosa are better known. 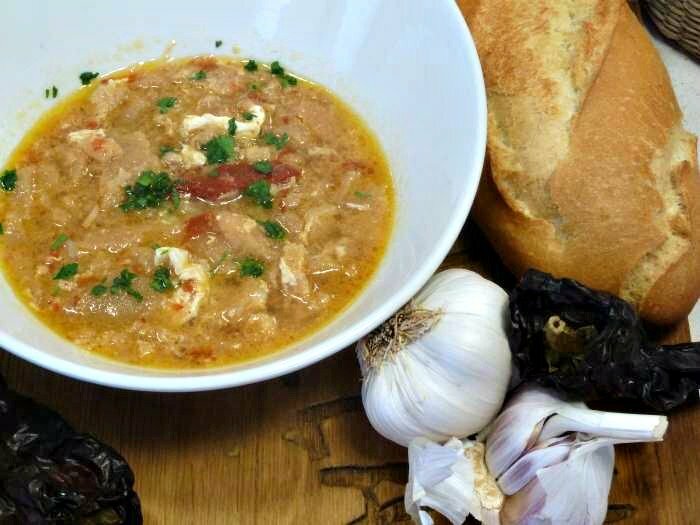 Both are equally tender and buttery and usually cooked with sausages in a stew, supplanting the chickpea stews so popular in other areas of Spain. Alubias Rojas de Tolosa: The dried red beans of the region are particularly flavorful and thus highly prized. If you should visit Tolosa one day, seek out one of the numerous bars or restaurants there that serves this red bean stew, which is traditionally accompanied with the spicy-hot pickled peppers known as guindillas. All of these dishes are staples of txokos, the gastronomic societies of Basque Country. These culinary havens are the dominion of men, as their rules restrict women from joining, though some societies make exceptions and allow them in once a month or sometimes once a year. Their purpose is to give members a place to show off their culinary techniques and creations and to have a good time cooking, eating, and drinking. These traditional societies have made significant contributions to the annals of Basque cooking, and some dishes that originated in txokos, such as marmitako made with salmon instead of tuna or various foie gras and duck breast dishes, have become classics. Equally traditional is barhopping before lunch of dinner, which is essentially a regional sport. 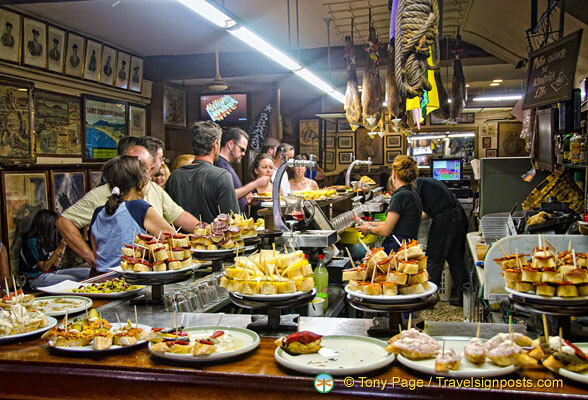 Bar counters display numerous pintxos, the equivalent to tapas in other areas of the country. Making the rounds consists of popping in and out of several bars, usually the same ones every day, grabbing a pintxo and drinking a txikito (a small glass of wine) in each one. It is a way to meet friends an acquaintances without arranging a specific date, before heading home for a proper meal. Cheeses are among the typical pintxos found in the region's many bars, with Idiazábal, produced in Navarra as well, the most highly regarded. The sheep's milk cheese holds such importance for the Basques that a contest to judge the best artisanal Idiazábal cheeses is held every September in the town of Ordizia, in Guipúzcoa. Prawn and Bacon Brochettes: The Spanish love bacon, which we cure and air-dry in the same way as our famous jamon. This combination of prawns and bacon is inspired and very popular, and can be found at most Tapas bar, as well as in many banquets and receptions. It is an ideal treat for your guests when having a party at home! Gildas: Gilda means lollipop, and the classic Gilda is a simple assembly of a guindilla (Spanish chile pepper), an anchovy and an olive. The combination of good-quality pinkish anchovies, smallish, crisp, unwrinkled chillies and a freshly pitted olive produce a sophisticaded mélange. Stuffed Mussels (Tigres): In Bilbao, these stuffed mussels are called Tigres because of their fieriness. I fondly remember the crowded little bars in the old part of Bilbao, where orders of tigres would emerge by the dozens from the tiny kitchens. Smoked Fish and Fruit Pintxos: Smoked fish and fresh fruit make a perfect match when combined in this recipe and served as an appetizer. Smoked salmon is now ubiquitous in Spain, particularly in the cities. Less evidence is traditional bacalao (salt cod), for which smoked mackerel is a substitute here. Rioja Alavesa, one of the three subregions of the La Rioja wine-producing area, is in the Basque province of Alava, an the wines from there are much lighter and fruitier than the ones from the other two sectors. Cider has long been drunk in Basque Country as well, but the wine drinking, perhaps because of the proximity to the Rioja region, is of greater cultural importance.